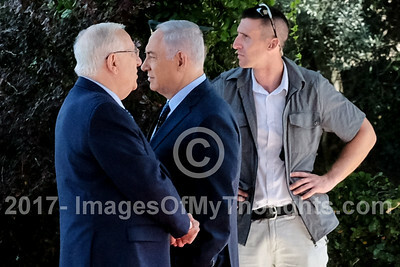 The President of the State of Israel, REUVEN RIVLIN (L), and Israeli Prime Minister BENJAMIN NETANYAHU (C) await the arrival of Rwandan President Kagame at the President's Residence. 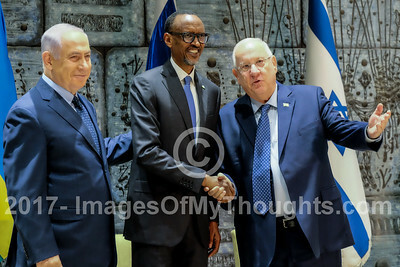 Israeli President Rivlin hosted a welcoming ceremony for Rwandan President Kagame at the President's Residence, prior to public statements and a work meeting between the two. Israeli PM Netanyahu joined the Presidents, exceeding traditional diplomatic protocol. Kagame has in recent years been a key ally for Netanyahu in his attempts to build closer ties with Africa. 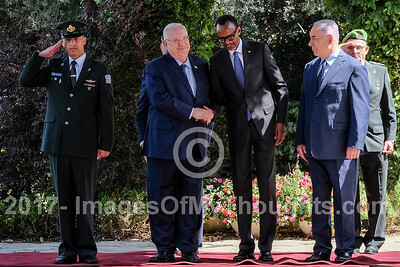 The President of the State of Israel, REUVEN RIVLIN (2nd left), hosts a welcoming ceremony for Rwandan President PAUL KAGAME (2nd right), at the President's Residence, prior to public statements and a work meeting between the two. Israeli Prime Minister BENJAMIN NETANYAHU (R) joined the Presidents, exceeding traditional diplomatic protocol. 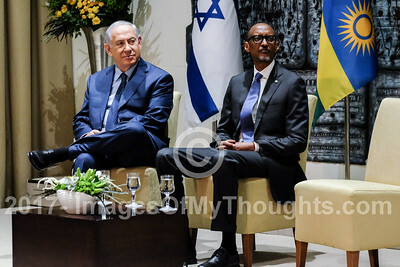 Kagame has in recent years been a key ally for Netanyahu in his attempts to build closer ties with Africa. 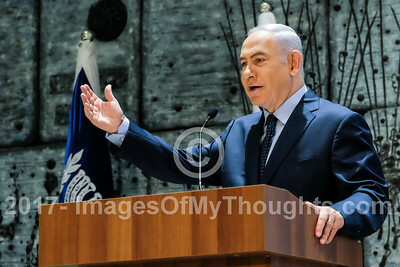 Israeli Prime Minister BENJAMIN NETANYAHU delivers a statement in a welcoming ceremony for Rwandan President Kagame hosted by Israeli President Rivlin at the President's Residence. 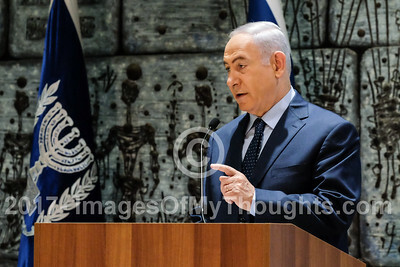 Netanyahu's presence exceeds traditional diplomatic protocol. Kagame has in recent years been a key ally for Netanyahu in his attempts to build closer ties with Africa. 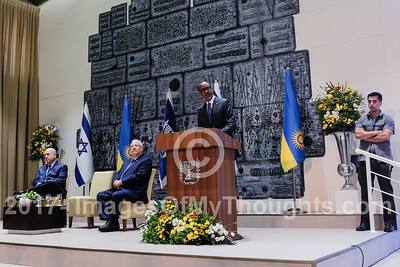 The President of the State of Israel, REUVEN RIVLIN, hosts a welcoming ceremony for Rwandan President PAUL KAGAME, at the President's Residence, prior to public statements and a work meeting between the two. 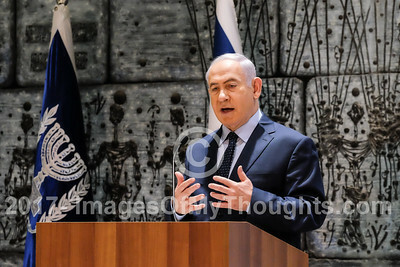 Israeli Prime Minister Netanyahu joined the Presidents, exceeding traditional diplomatic protocol. Kagame has in recent years been a key ally for Netanyahu in his attempts to build closer ties with Africa. 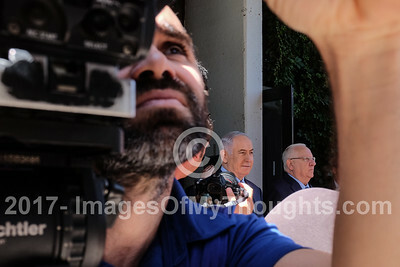 The President of the State of Israel, REUVEN RIVLIN (rear right), and Israeli Prime Minister BENJAMIN NETANYAHU (rear left) await the arrival of Rwandan President Kagame at the President's Residence. 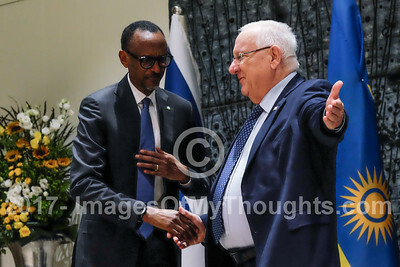 Israeli President Rivlin hosted a welcoming ceremony for Rwandan President Kagame at the President's Residence, prior to public statements and a work meeting between the two. Israeli PM Netanyahu joined the Presidents, exceeding traditional diplomatic protocol. Kagame has in recent years been a key ally for Netanyahu in his attempts to build closer ties with Africa. 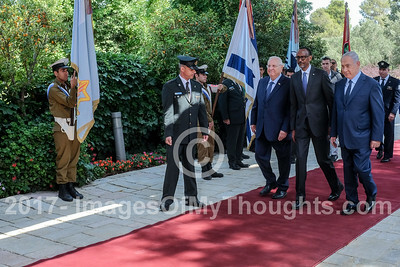 The President of the State of Israel, REUVEN RIVLIN, hosts a welcoming ceremony for Rwandan President PAUL KAGAME, at the President's Residence, prior to public statements and a work meeting between the two. 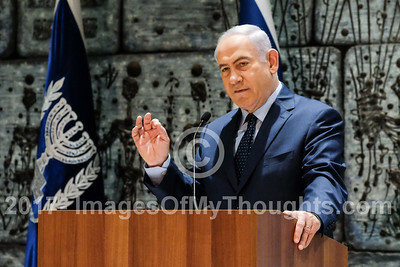 Israeli Prime Minister BENJAMIN NETANYAHU joined the Presidents, exceeding traditional diplomatic protocol. Kagame has in recent years been a key ally for Netanyahu in his attempts to build closer ties with Africa. 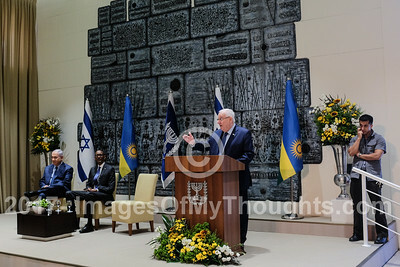 Israeli President Rivlin hosts a welcoming ceremony for Rwandan President PAUL KAGAME (R), at the President's Residence, prior to a work meeting between the two. 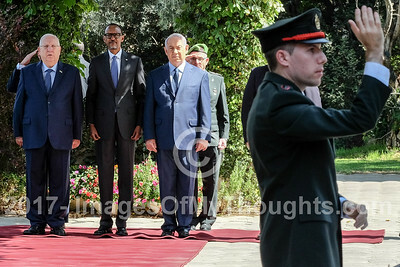 Israeli Prime Minister BENJAMIN NETANYAHU (L) joined the Presidents, exceeding traditional diplomatic protocol. Kagame has in recent years been a key ally for Netanyahu in his attempts to build closer ties with Africa. 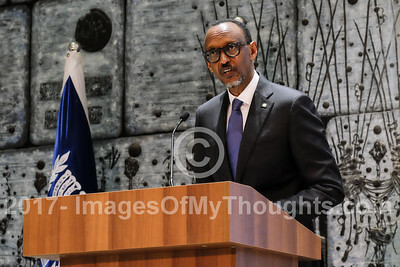 Rwandan President PAUL KAGAME, delivers a statement at a welcoming ceremony for Kagame hosted by Israeli President Rivlin at the President's Residence. 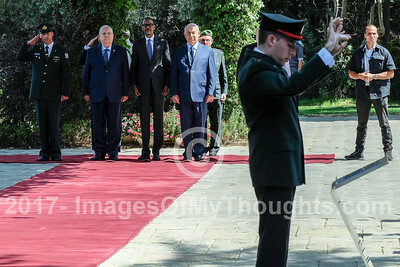 Israeli Prime Minister Netanyahu joined the Presidents, exceeding traditional diplomatic protocol. Kagame has in recent years been a key ally for Netanyahu in his attempts to build closer ties with Africa. 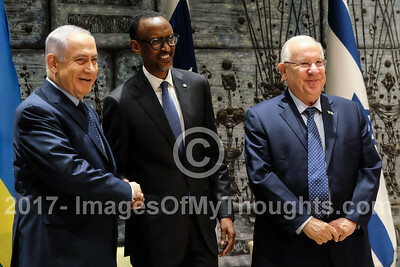 The President of the State of Israel, REUVEN RIVLIN (R), hosts a welcoming ceremony for Rwandan President PAUL KAGAME (C), at the President's Residence, prior to public statements and a work meeting between the two. 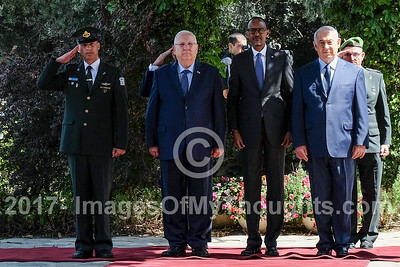 Israeli Prime Minister BENJAMIN NETANYAHU (L) joined the Presidents, exceeding traditional diplomatic protocol. Kagame has in recent years been a key ally for Netanyahu in his attempts to build closer ties with Africa. 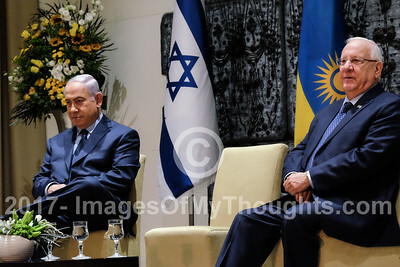 President of the State of Israel, REUVEN RIVLIN (R), and Israeli Prime Minister BENJAMIN NETANYAHU (L), listen to a statement delivered by Rwandan President Kagame at a welcoming ceremony for Kagame at the President's Residence. 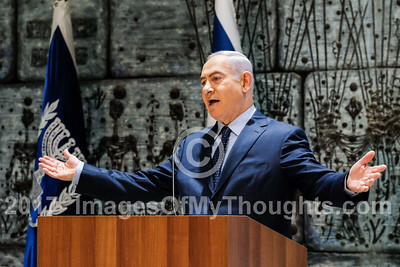 Netanyahu's presence exceeds traditional diplomatic protocol. Kagame has in recent years been a key ally for Netanyahu in his attempts to build closer ties with Africa.